Over 40 experts from Customs administrations and postal operators met in Brussels on 15 and 16 November 2018 under the framework of the WCO-UPU Contact Committee to discuss priorities, challenges and potential solutions for enhancing Customs-Post cooperation, in particular the implementation of electronic advance data exchange. The Contact Committee approved ‘the Joint WCO-UPU Guidelines on the exchange of electronic advance data (EAD) between Posts and Customs.’ These Guidelines are aimed at providing policy and technical guidance to designated postal operators and Customs admini­strations on how to establish the exchange of EAD, as well as gain support within the respective organizations for the adoption of this development project on a priority. They should be published in June 2019, once approved by the WCO Council. Recognising the significance of coordinated border management, particularly in the context of growing E-Commerce via post, the Committee agreed to add a section on cooperation with the UPU and designated postal operators in the WCO Compendium on Coordinated Border Management. Experts from Customs administrations and postal operators shared new and emerging regulatory developments on EAD (e.g. the EU’s Union Customs Code, US Air Cargo Advance Screening (ACAS) Programme and Strengthen Opioid Misuse Prevention (STOP) Act, Russian Federation’s pilot), related working experiences/practices and pilots/initiatives to secure and streamline the journey of a postal item along the supply chain, while ensuring efficient and effective compliance with various regulatory requirements. Challenges highlighted during the discussions referred to data quality, data protection and the operational ambiguities with regard to the implementation of pre-loading advance cargo information (PLACI) requirements in the context of the global postal model (e.g., the need for an assessment complete message, potential timelines for assessment complete, referral, and the need for an additional flow for responses to referrals). Delegates agreed to continue working on these ambiguities and other related issues through a joint expert team. As for the need to take into account data protection and confidentiality regulations, the Committee supported the idea of developing a model data sharing agreement (DSA) between origin post and destination post, as well as examining the possibility of having similar DSA between destination post and destination Customs. Delegates discussed practical solutions relating to data capture and data quality and strategies for facilitating the customer/sender transition to electronic data entry. In this context, the Committee examined ‘Joint Guidelines on the Data Capture and Improving Compliance with CN22/23 Customs Forms’ and agreed to enrich them with additional input and working examples. The Committee reflected on the successful outcomes of the pilot on the development of a standardized interface between the Customs Declaration System (i.e. UPU software that allows customers to enter data online, and enables Posts to exchange such data electronically with Customs) and UNCTAD’s Automated System for Customs Data (ASYCUDA). This solution is a significant development that will enable designated postal operators to exchange EAD with over 95 Customs administrations that are currently using ASYCUDA. Delegates were also informed about the UPU Postal-Rail project on the movement of postal items by rail from Asia to Europe, as well as the development of Guidelines for establishing an international postal rail transport service developed by the UPU Task Force, supported by the WCO. The progress with the development of a user-friendly and easily accessible list of prohibited and restricted articles in the postal chain to improve compliance was also presented. An online querying tool that links to a prohibitions/restrictions repository, which can easily be embedded in UPU and designated operators’ websites, has been designed by the UPU and will be launched soon, after carrying out further work in collaboration with the WCO and Customs administrations. The Committee initiated a discussion on the potential integration of CN22/CN23 and data harmonization with a view to addressing issues stemming from the growing E-Commerce, the PLACI and other requirements that are emerging as a result of the launch of alternative revenue collection models in some countries. 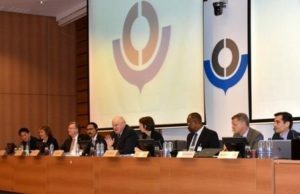 Furthermore, the WCO and UPU Secretariats presented the latest policy developments in their respective organizations, such as the WCO Framework of Standards on Cross-Border E-Commerce, the 2018 SAFE Framework of Standards, the UPU EAD Roadmap and the UPU Product Matrix. The two organizations also reported on the joint capacity building activities undertaken during the past months to promote further dialogue between Customs and postal operators and assist them in enhancing the efficiency of Customs-postal clearance processes, especially the establishment of an electronic data interface between Customs and postal operators, using joint WCO-UPU Customs-Posts EDI Messages. Discussing the future activities, delegates agreed with a plan to organize a joint WCO-UPU Customs Workshop for French-speaking countries in the West and Central Africa Region, among other things. Going forward, the Contact Committee adopted its work plan, which contains tangible deliverables to support the identified priorities in terms of improving the postal chain’s security and efficiency.